The State of the James report, the biennial progress report from the James River Association on fish and wildlife, habitat, pollution reductions, and restoration actions, reached its 10th anniversary in 2017, improving 10 points during its 10 year existence. Of the nineteen indicators included in the report, fourteen showed improvement over the last two years, three remained the same, and two declined. This shows the improvements that have been made due to increased awareness and funding toward the problems of the James River, including pollution, populations of certain animals, and dwindling habitats. Dennis Treacy, chairman of the Virginia Chamber of Commerce, commented that “The improvements reflected in the 2017 State of the James report are encouraging because a healthy local environment is important to a healthy local economy. 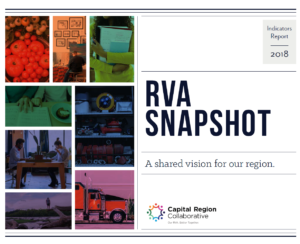 The James River not only supports transportation, commerce and industry, but also enhances our quality of life that draws tourism, attracts skilled workers and spurs new businesses.” The grade of a B- on this year’s report shows promise for the future, proving that positive change can and will happen when the right resources get put into making it happen. You can read more about the State of the James and view the full report here.